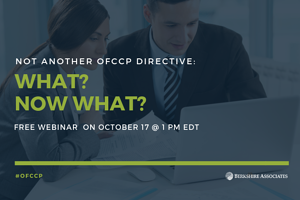 View a timely webinar entitled “Not Another OFCCP Directive: What? 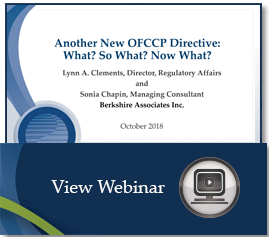 Now What?” Berkshire’s Director of Regulatory Affairs, Lynn Clements, and Sonia Chapin, a Managing Consultant at Berkshire, examine the nuts and bolts of each directive and their significance—on October 17 at 1 pm. Attendees of this webinar will gain insight into how these directives may impact their organization. Lynn and Sonia also share steps on how to prepare for any changes announced by the new directives.